An Illinois woman has reportedly filed a lawsuit in Madison County Circuit Court, claiming that she contracted blood cancer after being exposed to leaked benzene from the former Shell refinery in Wood River. And unfortunately, she’s not alone. Several Illinois lawsuits have been filed by cancer patients in recent years, and each suit makes virtually the same allegations. The new lawsuit alleges that the Shell and BP refineries released benzene into the air, groundwater and ground beneath her former Wood River home, as well as the local schools she attended. The plaintiff, 61-year-old Trudy Lehnen, currently suffers from multiple myeloma. 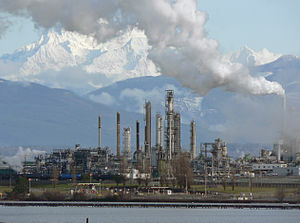 According to the complaint, she was diagnosed with the disease in July 1999 but was unaware of the connection to benzene exposure. She didn’t learn of the link until December 2011, when she read about an ongoing Illinois Environmental Protection Agency investigation of a benzene leak in Roxana. She is seeking at least $200,000 in damages. The link between benzene exposure and various blood cancers is irrefutable. It has been known for more than a century, and acknowledged by The American Cancer Society, the CDC and a wealth of other major medical and health organizations. Prolonged and even moderate exposure to benzene can dramatically increase one’s risk of developing cancer, and people who live or work near refineries are at an especially high risk. Shell and BP have denied any wrongdoing in the ongoing lawsuits, although they have acknowledged that benzene exposure can carry a cancer risk. Shell is currently assisting the Illinois Environmental Protection Agency to clean up pollutants near the former Wood River plant, but for many local residents, the damage is already done. Have you or someone you love been in the victim of benzene exposure? If so, you may be entitled to compensation. Call the national benzene attorneys at Nadrich & Cohen today to discuss your case and receive a free consultation from one of our qualified representatives. You must act quickly, though. In order to gather the proper evidence, we must begin our investigation as quickly as possible.